Our position has always been that the Migration Museum we are working to develop will be a museum about emigration as much as about immigration, and for two main reasons. The first is that, until the 1980s, Great Britain was a net exporter of people – more people left the country than came into it – and emigration has been a core part of our history for thousands of years. And the second is that every immigrant into a country is, of course, an emigrant from another – but, when people talk about migration, the focus tends always to be, unevenly, on the impact of immigration rather than that of emigration. In this guest blog, Murray Watson tells the story of one particular episode of emigration in the immediate aftermath of the Second World War. This is in many ways a much less widely known story than that told by Mihir Bose in his recent blog comparing the current migration situation with that within Europe in the years following 1945. Away from the ration book . . . The mass movement of people in the years following the Second World War was exceptional. 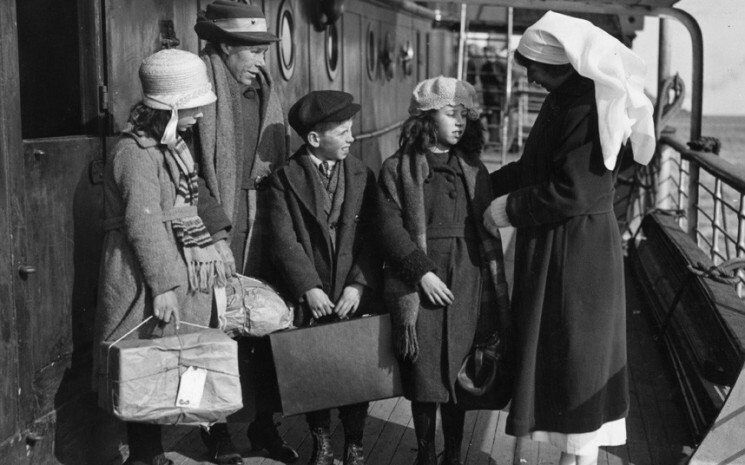 Much has been written about war brides and the millions of displaced persons as well as returning military personnel; but little attention has been given to the mass exodus of young British emigrants desperate to depart Britain’s war-torn shores. I say to those that wish to leave our country, “Stay here and fight it out.” If we work together with brains and courage, as we did in days not long ago, we can make our country fit for all our people. Do not desert the old land. 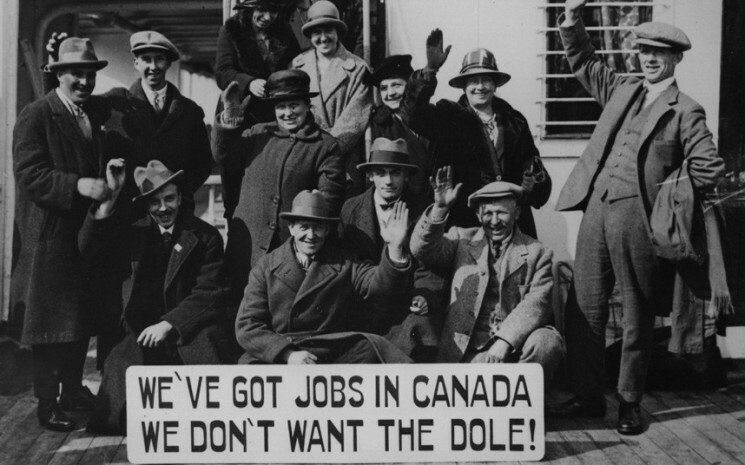 Canada was the most popular destination for post-war British emigrants, with over half a million emigrating there in the 25 years after the war. Other popular destinations, according to secretary of state Duncan Sandys, were Australia, New Zealand, South Africa, Rhodesia–Nyasaland and the USA. 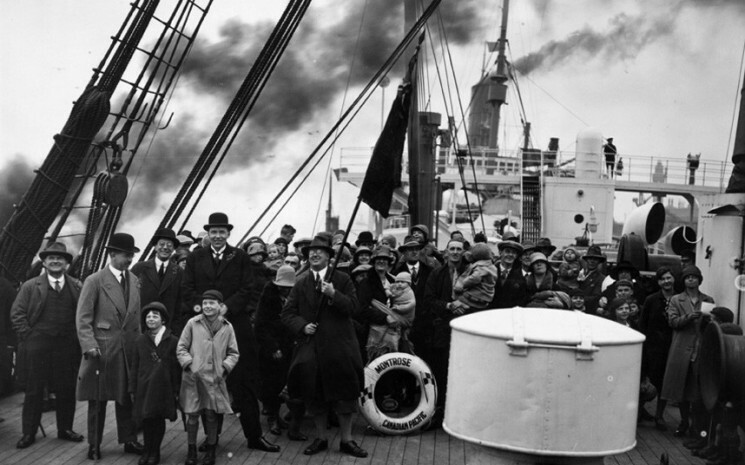 Why was emigration such an important phenomenon after the war? My new book, Invisible Immigrants: The English in Canada Since 1945, co-authored with Marilyn Barber, reveals a complex mix of explanations. What was evident was that there was a pervasive nationwide propensity to emigrate; most adults would have been aware of some of their friends or family thinking about leaving Britain in pursuit of a new and better life. The euphoria after VE Day and VJ Day was short-lived. The costs of fighting the most expensive war in history had plunged the country into a series of economic crises that even the Marshall plan from the USA could not relieve. Cities were bomb-scarred, and housing shortages – exacerbated by returning troops – were critical. There were food and fuel shortages, and an austerity regime rationing food, fuel, furniture and clothing continued until 1954. Newly married couples were often forced to share with parents or to live in cold, inadequate homes. And, if that was not enough, there was the winter of 1947, a winter of Canadian proportions that made life even more miserable. Conditions were such that George Drew, the Premier of Ontario, handed out food parcels from the people of Canada to hungry residents in Suffolk. George Drew was a wily operator. He, along with other politicians in the Federal Government, wanted to attract British immigrants. Drew, in another publicity stunt, personally welcomed the first thirty-nine airborne immigrants who arrived in Toronto on a Skymaster aircraft run by Transocean Air Lines in 1947. 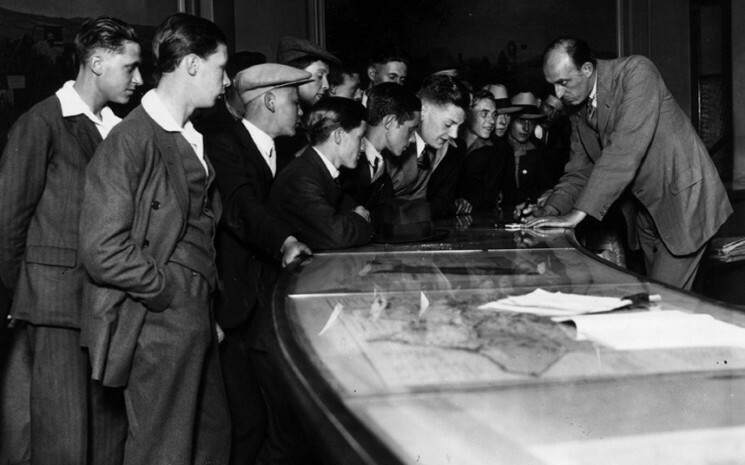 Immigration offices from Commonwealth countries sprang up in cities throughout the UK, with Australia, Canada, and New Zealand extolling the benefits of better housing and employment opportunities, as well as offering incentives for an unsurpassed quality of life. 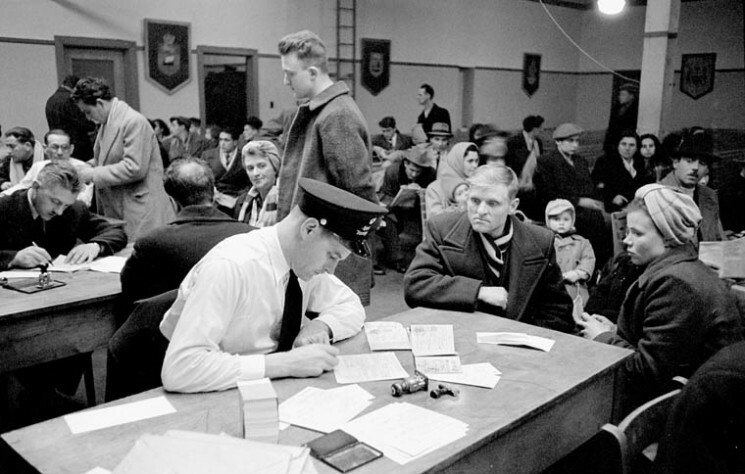 An immigration official processing new arrivals in the customs hall at Pier 21 in Halifax, Nova Scotia. At the age of twenty-one James Roland decided it was time to seek pastures new. He went to London and, as he recalled, ‘I sort of had this idea of the Commonwealth in my mind.’ He planned to go to the Australian, New Zealand and Canadian High Commissions to learn about emigrating. He went to Canada House first and never got any further. There he found a huge room full of people all wanting to go to Canada and waiting for several days to be processed. When an immigration officer discovered that Roland had a degree, however, he was fast-tracked and emerged three hours later, having had a medical and obtained an assisted passage and landed immigrant status. He did not bother to investigate Australia or New Zealand. 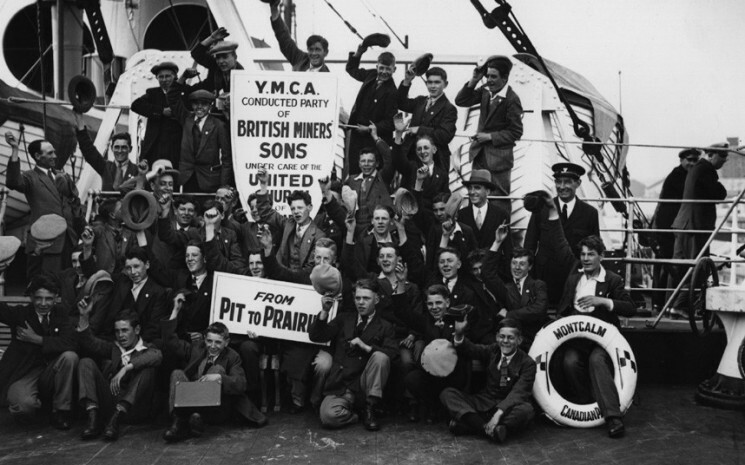 A group of cheering miners’ sons on board the ship Montcalm as they emigrate to Canada. The crowded rooms and queues at immigration offices were largely populated by young people – married couples, nuclear families, and single men and women. James Roland was typical of the single people who emigrated. In the years after the war there was an urge to travel, for adventure and excitement. Shortages of cash and frequent spells of exchange controls meant there were few of the opportunities enjoyed by the backpackers of today. People had to go on working holidays, which meant they had to secure landed immigrant status. Some of these people returned, but many remained in their new homes. You can discover more about these hidden histories from dozens of immigrants who were interviewed for my new book. Our recorded life stories are intensely private, often funny, and occasionally heartbreaking. Many of the immigrant interviewees talk frankly about their motivations, fears, expectations, and family separation anxieties. Others refer mainly to their public lives, revealing insights into how individuals and families integrated into local communities and the Canadian way of life. The book also includes comparative examples of experiences of other immigrants, including those who went to Australia and New Zealand. Some accounts are positive, others negative; some are sad, others happy; some are success stories, others are not. They reveal memories about hardship, first impressions, culture shock, heartbreak, love, family, illness, death, ambition, work, patriotism, and much more. Dr Murray Watson is an honorary research fellow in the School of Humanities (History) at the University of Dundee. He is the author of Invisible Immigrants: The English in Canada since 1945 (University of Manitoba Press, 2015) and Being English in Scotland (Edinburgh University Press, 2003). He was also a post-war migrant himself, emigrating to the West Indies with his parents and siblings in 1959.